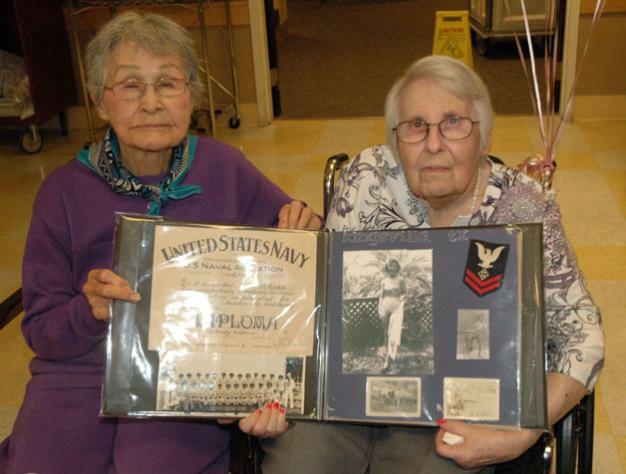 Blanche Coy James, left, helps her childhood friend, fellow 90-year-old Barbara Caton VanderVeer, hold up VanderVeer’s memorabilia from serving in the U.S. Navy during World War II. EVERETT — Even though Barbara Caton VanderVeer is not a Tulalip Tribal member herself, she can still remember what the Tulalip Indian Reservation looked like more than 80 years ago. VanderVeer turned 90 years old on Feb. 26, and not only did her family help her celebrate her birthday at a party at the Providence Regional Medical Center in Everett on March 2, but so did her best friend, Blanche Coy James, a Tulalip Tribal member with whom VanderVeer grew up on the reservation. “I’m 7 months older than her, and I won’t let her forget it,” James laughed. Although VanderVeer and James briefly lost touch during World War II, they reunited by chance in Seattle shortly after the war, around the same time that VanderVeer met her future husband. VanderVeer was kept busy during the war by teaching gunnery to fellow sailors in the U.S. Navy, for which she still proudly shows off her certificates and rank patches. Between the time she entered the fleet in 1943 and when she got out nearly three years later, she was promoted up the chain to petty officer second class. VanderVeer acknowledged that being stationed in Corpus Christi and Kingsville in Texas as part of her service marked quite a different climate from what she was used to in Washington, but in many ways, the local area that she and James grew up in is almost as stark a contrast to the region as it stands today. “We would walk around in the dark and not even worry,” James said. In the years since then, VanderVeer’s family has grown to include one daughter, four grandchildren, seven great-grandchildren and three great-great-grandchildren. This entry was posted in Arts & Entertainment by Kim Kalliber. Bookmark the permalink.